Before settlement assets can be passed over to Te Rarawa, a legal structure referred to as the Post-Settlement Governance Entity (PSGE) must be in place to receive them. Te Rūnanga o Te Rarawa is currently a charitable trust. The Crown will not return settlement assets to a charitable organisation. The PSGE outlined here meets the Crown requirements; is designed to be accountable, viable and sustainable, and provides the best opportunities to secure the future economic independence of Te Rarawa. Te Rarawa has received expert advice to identify and develop the best options for moving the Iwi forward. This model aims to achieve a simple, flexible and tax efficient structure that complies with legislative requirements as well as contributing to the inter-generational aspirations of Te Rarawa. 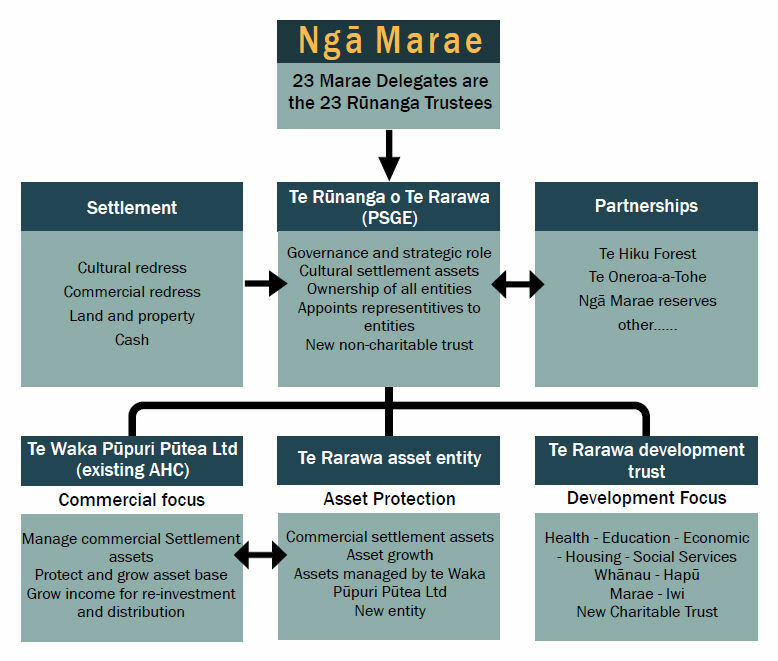 To help you understand how the settlement resources will be managed after the settlement, an overview of the proposed PSGE and how it merges Te Rarawa’s current governance and operating structure has been outlined in the diagram on the next page. It is proposed that, with its restrictive charitable trust status, Te Rūnanga o Te Rarawa be disestablished and at the same time a new non-charitable trust entity will be set up. This entity will retain the existing 23 marae delegate structure and keep the name Te Rūnanga o Te Rarawa. Te Rūnanga will continue to govern and maintain overall ownership of all other post settlement entities created as a result of the Treaty claims process including the appointment of representatives to those boards. Settlement assets (land, property, and cash) will be transferred to Te Rūnanga o Te Rarawa. Cultural assets will be held by Te Rūnanga o Te Rarawa until the most suitable entity is identified. Where agreed, commercial assets will be transferred to the Te Rarawa asset entity. The governance and strategic role of Te Rūnanga o Te Rarawa will be financially supported by returns from all commercial assets managed by Te Waka Pūpuri Pūtea Limited (the Asset Holding Company for Te Rarawa). Te Rūnanga o Te Rarawa will also be actively involved with a range of Iwi, marae and governance partnerships formed as part of this settlement. These have yet to be set up. They relate to the management and care of shared assets such as Te Hiku Forest, commercial properties, Te Oneroa a Tōhē Board, and the Social Development Accord. Where cultural redress whenua is being returned, the Negotiations Team will meet with relevant hapū/marae before settlement to determine how the land will be governed and managed. Commercial assets (land, property, cash) received as part of the settlement will be vested into the guardianship of the Te Rarawa Asset Entity, a new entity. These assets will be managed by Te Waka Pūpuri Pūtea Limited with the primary goals of protecting the asset, growing the asset and increasing the income generated by these assets for reinvestment, and distribution to Te Rūnanga o Te Rarawa and the Te Rarawa Development Trust. The existing Te Rarawa Asset Holding Company called Te Waka Pūpuri Pūtea will hold all commercial assets required by the Māori Fisheries Act as well as other taxable company assets, and will manage all assets held by the Te Rarawa asset entity. The main focus for Te Waka Pūpuri Pūtea Limited will be commercial, with an emphasis on protecting and growing Te Rarawa’s asset base as well as growing the income for reinvestment (growing the asset base) and distribution to support the activities of Te Rūnanga o Te Rarawa and the Te Rarawa Development Trust. This new charitable trust will have a development focus, including the inter-generational development of Te Rarawa people with a focus on the health, education, housing, economic, environmental and social development of Te Rarawa whānau, hapū, marae and Iwi. To help it achieve its development objectives, the Te Rarawa Development Trust can be supported by Te Rūnanga o Te Rarawa via returns from all commercial assets as managed by Te Waka Pūpuri Pūtea Limited (Te Rarawa’s Asset Holding Company).